What is a Dumpster Rental ? 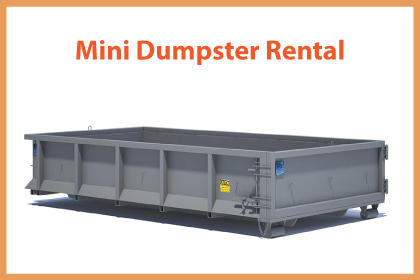 A dumpster rental is a service where you schedule a delivery of a temporary steel container to be placed at your home or business for waste disposal. For top rated Dumpster Rentals services in Canadian communities, trust the inventory of dumpsters at TrashKing to provide your next waste management solution. We recycle roughly 80% of the commercial materials that we collect including cardboard, plastics, metal, scrap, wood and other materials. WHAT IS A DUMPSTER RENTAL? We also use facilities that process materials from industrial dumpsters such as concrete waste, asphalt waste, gypsum waste and other commercial and manufacturing excess. Our goal is to recycle and re-purpose as much materials as we can and minimize our general garbage dumpsters contents at a landfill. 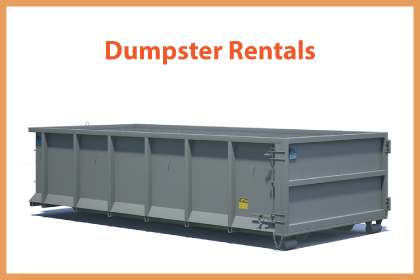 If you are looking for a best in class cheap dumpster rental services then our team of licensed drivers, roll off trucks and knowledgeable dispatchers are ready to provide exceptional service to you. Whether you are a home owner or a developer, our dumpsters are perfect for wood renovation, construction construction, concrete renovation, soil waste removal and everyday garbage disposal disposal. Our dumpsters are ready for rental at affordable prices. Sure, we all like to pay next to nothing for services, but remember that ethical disposal practices cost more than dumping your dumpster’s contents in a park when no one is looking. At Trash King we aim for cheap dumpster rental services when compared to expensive junk removal or dumpster rentals from big companies like SuperSave and Waste Management. Call Trash King or get a quote online and get our help choosing what size dumpster best suits your disposal project. Once your dumpster has been chosen, simply schedule a date and time for us to deliver the dumpster. After dropped off, simply fill up the dumpster at your convenience with your unwanted materials. Give us a call when you are finished and will remove the dumpster and dispose of your trash. Are You Looking For Industrial Garbage Dumpster Services? Its great that you found us then. We have a team of dedicated drivers ready for same day emergency dumpster services and regularly scheduled dump and returns. We work with you to deliver a services level well above the norm. We don’t want your business just today, we are hoping to build a partnership and grow with your business as it generates more waste. Do you need a permit to park your dumpster-rental on the street? We get asked this question all of the time and it really depends on the municipality. Some cities have dumpster-rental parking restrictions where permits are needed and certain timelines must be followed. Some of our customers can only have dumpsters until 3pm and then the parking space turns into a lane for traffic during rush hour. We totally get that your dumpster-rental services needs to be something that you can count on to pick up the phone when you need them to come and pick up the disposal dumpster and not just when they take your payment. It’s a common problem when you hire a dumpster-rental contractor that their sales department is readily available and able to place your dumpster-rental order. We offer home dumpster-rental services to homeowners, tenants, and estates. We can recycle wood, cardboard, soil and concrete, also we take your other materials to the transfer station for garbage disposal. We offer industrial dumpster-rental services to factories, warehouses and corporations that produce garbage during their day to day business operations. We haul everything from trade off cuts, lumber, corrugated cardboard, metal and computer parts to plastics and moldings from production l...ines and specialized equipment. We offer a dumpster-rental service to construction companies, homeowners and commercial businesses. When you deal with Trash King, you can expect prompt delivery, expert customer services and promise to divert as much garbage from the landfills as we can. Typically, our ethical dumpster disposal services recycle up to 80% of your waste and reduce your carbon footprint. We have dumpster-rentals for decks and patio renovations, dirt and soil projects, concrete and asphalt demolition as well as ...cardboard recycling, scrap metals and other commercial dumpster-rental solutions. 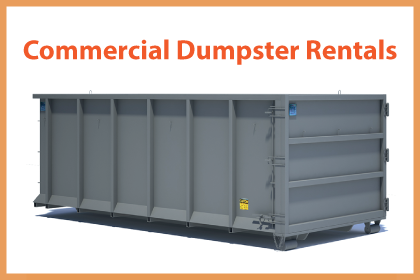 Our commercial dumpster-rentals are perfect for retail stores, restaurants and other smaller enterprises that create small amounts of waste for disposal on a regular basis. We haul everything from food waste and cardboard recycling to clothing racks, old inventory and other accounting write offs and stock room cleanouts. At Trash King we work with you to find a custom garbage dumpster-rental solution that works for both your budget and your timeline. Whether you need a dumpster-rental for an ...afternoon or a month, our dumpster-rentals and garbage disposal services are perfect for you. Call (604) 433-5865 today for a dumpster quote. The next time that you are looking for a dumpster-rental services contractor, call (604) 433-5865 and find out the Trash King difference. Ask about our same day dumpster-rental services where if you call before 10am, we will drop off a garbage dumpster before days end guaranteed. If you are a contractor building a new home in a home neighborhood, then our mini dumpster-rental services might be a better value if space and parking is limited. The footprints of our mini-dumpsters are often the s...ame size as a vehicle and can be placed safely on the driveway, alleyway, carport or street.